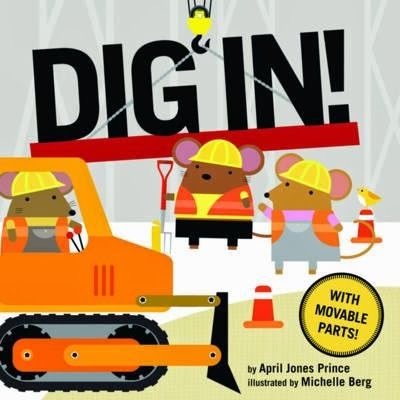 Home » Board Books » Reviews » Reviews by Sarah » Sarah Steed » Vehicles » Review: Dig In! Until recent years there were surprisingly few picture books featuring trucks and tractors and the like. For that reason, whenever I see a new one, it piques my interest. Dig In! is a board book with rhyming text and movable parts, sure to enthuse young readers. Little mice workers are in control of a worksite where “Crew arrives at break of day. Get to work, right away.” The rhyming seems a bit forced at times, but can be forgotten amidst the action on site which includes “goop galore” in the cement mixer that you have to “spin to mix, reverse to pour” and rolling mountains “nice and flat”. The movable parts (like spinning wheels and mixers) are a change from the traditional lift-the-flap found in board books, though they do require some care to use. Make sure you read carefully and look closely at the pictures to discover what the workers are really creating - there’s a surprise kids might not realise is there, as the worksite turns out to be a kitchen of sorts. All in all, Dig In! is a book to be enjoyed by the very young, especially those captivated by machines.